My wife and I really want an iPad. We do not have a really good reason or a need to want one other than they look super cool. But, we have made a commitment to each other not to charge the top of the line iPad that we want on our credit cards. Sometime during this holiday season or in the early Spring of 2011, Apple estimates that it will sell its ten millionth iPad. And, over 55 million tablet based computers will be sold during 2011. In an informal poll on USAA, the financial services giant dedicated to serving the military, the family members, and veterans, 9% of respondents said that they received an iPad for Christmas and the holidays, 7% already owned one of the devices, and another 45% are planning on purchasing one in the near future. My wife and I are now the proud owners of a brand new savings account with its own nickname of “Future iPad”. We have also set up an automatic deposit into the account in order to help us meet our goal. Nicknaming the account is a great way to give you something to aim for. It keeps your eyes on the prize so to speak. When I am saving for a purpose such as a new iPad, it helps keep me focused on the task at hand. For as little as $25 per paycheck, you can deposit money into an account dedicated towards completing a specific goal. Savings account nicknames can help you also save for those budget busting items that are tough to account for in your monthly written budget such as Christmas and birthday presents as well as unpredictable things such as car repairs. USAA is currently developing an App for the Apple iPad that is built from the ground up with the device solely in mind to fully leverage its unique interactivity. The App will deliver many of the transactional features already found on USAA’s App for the Apple iPhone in addition to other great content. USAA plans on allowing its customers to view their bank balances, see past account history, transfer funds, pay bills online, view insurance policy details, pay your premiums, review coverages, view real time stock quotes, place a stock trade, and view articles and videos providing helpful financial advice. In the past, I have discussed how you can buy, insure, and finance a new car through USAA’s Auto Circle program which has been interwoven into the USAA mobile banking app on the Apple iPhone, iPod, Android, and Blackberry. The bank was also an industry leader that lets you deposit checks directly to your checking account with the simple click of your smart phone’s camera and scan your checks for deposit with the [email protected] program. 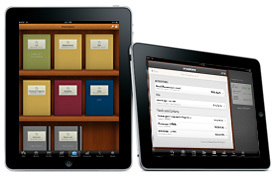 The bank’s upcoming iPad app will also add a lot of great content, news, and advice that USAA is known for. Apple is everywhere. Apple iPads are all the rage. There’s an app for that. There’s an app for everything. And, with a savings account nicknamed “Apple iPad”, eventually there will be an Apple iPad paid for with cash sitting on my desk as well. I love iPads. They are so awesome. There are so many new apps coming out for them, and I didn’t realize that there were going to be iPad only ones. I personally think it’s a waste and would be better invested in purchasing and upgrading a netbook with a SSD, 2 GB RAM, and run OS X or Ubuntu. On the other hand, it’s great that you’re saving and prices will continue to fall as various iPad versions come out just like the revisions made to the iPod and iPhone.